I am seldom surprised when it comes to games. You read about them, see some screenshots or video and you get a sense of what the game is all about and what it will deliver. Of Orcs and Men is one of those games that actually managed to surprise me; I had read about it, seen some screenshots, and I thought I knew what we were going in to see at the Focus Home Interactive booth this year. Mark and I went along to get a look at Of Orcs and Men and the latest Sherlock Holmes game, but Mark will tell you about later. Of Orcs and Men is a soon-to-be-released RPG from French developers, Cyanide Studios, taking an alternative look at the classic fantasy scenario of a war between humanity and Orcs. Battles between the two races ended in the orcs being driven back, enslaved and brought close to extinction. The emperor of man has decided that, rather than wait for the orcs to recover from their loss, humanity will commit genocide – ending the orc race and preventing further war. Players will take on the role of an elite orc soldier tasked with assassinating the emperor of humanity and a goblin who joins him later in his mission. The first thing that struck me while watching the demo was how detailed this game actually was. We were shown a few levels from the game, the first taking place on a rainy night outside of a human encampment. Using the custom built Silk Engine, Cyanide have done something truly extraordinary with the visuals on this game. During an in-engine cut scene, water could be seen splashing and running over the ground and other environmental surfaces as well as over the incredibly high resolution textures of the characters. It’s hard to put into words, but everyone in that room was blown away… well everyone except the rude journo who was falling asleep in the back, but that’s another story. It was explained that the developers had put a lot of work into producing an engine that could effectively handle dynamic weather effects, and to say they pulled it off would be an understatement. We were later shown a level set in an arctic mountain region that looked incredible, with snow whipping off of hills while the player looked out on to huge mountain vistas. 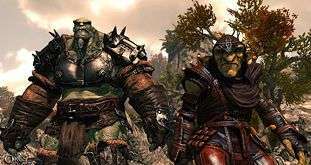 The tandem gameplay, moving between the orc and the goblin, is something that is incredibly well done and hasn’t really been seen since games like Army of Two. The difference between this and Army of Two is that each character has his unique strengths. The orc, as you would imagine, is the brute of the party, capable of soaking up and dishing out huge amounts of damage in a slow and controlled way. He plays the tank, drawing off multiple targets allowing the goblin to do his thing. Where the orc specialises in heavy hitting, the goblin, the smaller of the two, is the master of stealth and ranged combat. In some of the gameplay we were shown, the goblin is capable of entering a sneak mode that many MMORPG players will be familiar with if you play as a rogue. This allows the goblin to scout out ahead of the orc and if need be, take out single enemies, clearing a path. This comes into its own in larger battles, where both the orc and goblin have to work together to finish enemies. In the particular fight we got to see, the orc actually picks up the goblin and throws him at a distant enemy to battle one on one, while the orc takes on three enemies. The AI works in such a way as either character can be set to a particular stance, allowing the player to take control of the other character and dish out damage. The orc can be set to tanking, drawing the attacks of the enemy, while the player controls the goblin and runs around picking off enemies. Worry not RPG fans, there will also be a huge amount of customisation in the game, allowing you to work towards perfecting your warrior orc or goblin assassin. The system in Of Orcs and Men is very similar to other games – every kill grants experience points and these points are spent unlocking new abilities. It’s not the most inspired system, but it gets the job done. There are shared ability trees, such as offensive attacks, and each character has their own unique skill tree – the orc has the defensive tree, allowing him to deal with high amounts of damage, while the goblin uses a ranged tree, dealing with the throwing knives and other ranged attacks. Each of the abilities has two available upgrades, of which the player can only pick one, to augment the ability. Unfortunately, further details were a little thin on the ground as the developers were keen to show off the new engine and the combat. We were told that the skill trees would be expansive and really augment how the characters work in combat. I was pleasantly surprised by Of Orcs and Men. Not only does it look to deliver solid RPG gameplay, with its own unique twist on a classic fantasy story, but developers Cyanide Studios have produced one of the best looking games I’ve ever seen. For something of this level of quality to be delivered by a little-known French developer who have previously only produced some Warhammer based sports games and the recent Game of Thrones RPG, I think is outstanding. The detail on the character models alone is enough to sell this game for me. 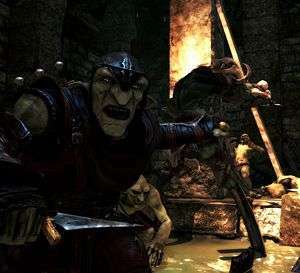 Of Orcs and Men is expected to release towards the end of 2012.